Are you considering adding a new kitten to your household? Kittens are highly social animals and spend most of their waking hours playing and interacting with everything around them. Cats can live more than 20 years, to make both your lives amazing together, we have compiled a list of great kitten know-how to get you started. Cats will try to get into every space, nook and cranny in your home; they will climb your curtains, and end up on the highest shelf. It is important to ensure your home is safe for your cat to play and explore without breaking things or hurting themselves. As any cat owner will tell you, they have to qualms with knocking your priceless vase down. The most important thing you can do is make sure that all chemicals, cleaning products and other harmful items are away where they can’t get to them; just somewhere that you keep closed is fine. Did you know? Even dog-friendly products can harm your cat. Ensure that you read product labels carefully. Houseplants can pose a threat to your cat also. It is crucial that you know what plants are in your home and whether they are toxic to cats. Cats use plants to aid in digestion and will chew whatever plants are in your home. Providing cat grass can help with this, but it is best not to risk them ingesting a toxic plant. Lastly, make sure that you do not have random items lying around that may look like a fun toy. Elastics, pennies, dryer sheets, nails and more may seem like a play thing to your cat, but can cause major health problems if ingested. If you think your cat ate something it shouldn’t, take them to the vet immediately. Kittens should not be adopted until 10 to 12 weeks old. During the first stages in their life they will learn cat behaviours from their mother and siblings. As much as you may want to bring it home as soon as possible, this time is important to the development of our adult cat. Your new kitten may be shy or fearful in their new environment. Just give them time and they will adjust. Do not force them into situations that may scare them and let them explore in their own time. The kitten needs to feel secure and warm in their new home. Provide a cozy bed with a blanket to snuggle in a quiet place. Keep their food, fresh water and toys near their bed. Try to keep this area secure until they are more comfortable and a bit older (or you can properly watch them). Cats instinctively will look for somewhere to dig and bury when it’s bathroom time. Keep a litter box nearby until they are more comfortable and a bit older. This will make training easy! 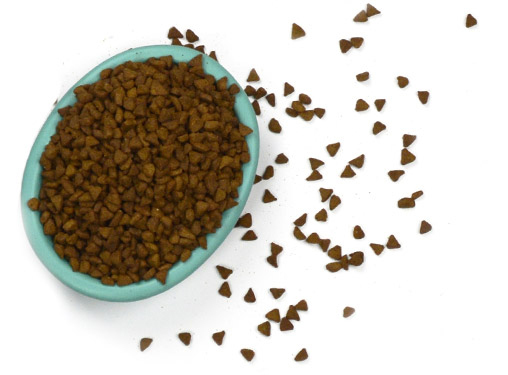 A dust free, non-clumping litter should be used until the kitten is at least 6 months old. As they are lower to the ground the dust will get in their lungs much more than an adult cat and they tend to lick the litter off their paws. A well socialized cat is a happy cat (and even happier owner). Although everyone will want to hold the kitten, limit handling for the first few days while your new pet adjusts. Set up their bed, litter box and food in a quiet and secured room. Introduce family members one at a time and allow the kitten to come to you and learn your scent and touch. This goes for other family pets also. Give them time to adjust to each other and ensure that you monitor their interactions. Your old cat or dog may not appreciate the new kitten right away. It is best to initially introduce them through a carrier or behind a gate until they get to know each other’s scent. During the introduction, separate the pets at any sign of aggression and be patient. If you have children, you should start socializing them with your new kitten right away. Make sure that you teach your children that the kitten is not a toy and must be touched gently and that play time is over when the kitten is done. Do not force the kitten to be touched or help when it does not want to be. That cute little rambunctious kitten will all too soon become an adult. In order to have an amazing adult cat you need to train the kitten as to what is acceptable. Avoid punishing them or correcting them in a way that makes them fearful or reluctant to come to you. Blowing on them or snapping your fingers are some ways to get their attention away from whatever they are doing. Don’t tease or play games that encourage play-biting as this will carry over into adulthood. Make sure to reward good behaviour too. Watch and reward your kitten whenever you catch them doing something right, using the litter box and scratching post, playing with toys and being calm when you touch them. Cat Bed: Most cats do not feel secure at floor level and they often prefer to be high up. Try a cat bed somewhere high up that your cat has easy access to. Litter Tray: A litter tray, cat litter and a scoop are essential. Their litter tray should always be accessible and easy to find. Choose a box that is deep enough to keep your cat from scattering litter when they dig. It’s best to use about two inches of litter in the bottom of the tray. Food: Initially, feed your cat the same diet as it has been used to and once it has settled in, you can gradually change it onto your chosen diet. A cat needs a balanced diet and none more so than a kitten, to provide for growth, maintenance and energy. Cats are naturally carnivorous animals and need to eat meat to live, do not be tempted to try and bring up your cat as a vegetarian. Water: Although water is not regarded as a nutrient it is essential to life. It can be argued that its provision is more crucial than a supply of food; a cat can survive much longer without food than it could without water. Water has many roles in the body: It transports nutrients and metabolites in the blood. It is a vital part of the temperature regulation system. It is essential for the digestion and metabolism of food. Cat Carrier: A cat carrier is essential, even if you plan to travel no further with your cat than the Veterinary Clinic. If you accustom your cat to the carrier from an early age, it will make future trips to the Clinic or Groomer much easier. Look for one that will be roomy, well ventilated, escape proof and easy to clean. Brushes and Combs: Cats need help with their grooming. While grooming your cat, take the opportunity to have a quick health check of your pet. Grooming should be a regular part of your cat’s routine. Although your cat will probably want to make a game of it and try to bite the brush and comb, they will soon come to appreciate the attention they receive. Toys: There are many types of toys for your kitten. Playthings come in all shapes and sizes, with feathers, crinkles, squeaking sounds, movement and more! Experiment with your kitten and see what types of toys they like to play with. Kittens will not be affected by cat nip until closer to a year old, so try to find other toys that can entice them. Scratching Posts: A scratching post will give your cat a place to stretch and exercise, as well as keeping their claws in good condition. It will also help to prevent them from using your furniture to satisfy these needs! The secret is to show the cat what to do. Hold them near the post and scratch their claws on the surface. They will soon form an attachment to their new toy. Lead and Collar or Harness: Most cats don’t like to walk on a lead. Some cat breeds –notably Siamese– do enjoy walking on a lead with their owners. For cat owners in urban environments, however, a lead may be the only way for your cat to enjoy the outdoors. If you plan to use a collar or harness, your cat should be introduced to it early on. A collar should be elastic or have a breakaway section, so that the cat can escape if the collar catches on an object. A collar or harness should carry identification in case your cat gets lost. Nail Cutters: If you need to clip your cat’s nails use sharp cat nail cutters (if they are not sharp, the nails can split). Approach this task when the cat is sleeping or very relaxed. Push out the claw and trim off the tip of the nail. Avoid hitting the quick (the pink part in the nail) as it can cause them to bleed.